While we didn't get along with Archos' 9-inch Windows tablet, released last year, the Archos 101 thankfully addresses many of our chief concerns. The result is a highly usable and well built mobile tablet computer. Although boasting a 10.1-inch screen, it's thinner than its older brother at just 15mm. It's solidly built yet still light, and the 450-minute battery life is more than enough to keep you entertained all day. Bluetooth 2.1 is supported, so you can pair it with compatible devices such as smartphones and headsets. Ports are comprehensive, including a standard USB port as well as mini USB, and mini HDMI for connecting to an external display. The low-resolution front-facing webcam is fine for web chats, while a microSD card slot expands the 8GB Solid State Drive. A foldout stand at the rear is a nice touch, and is great if you want to watch a movie. Navigating Google Android's menus is a smooth experience thanks to the sensitive capacitive display. 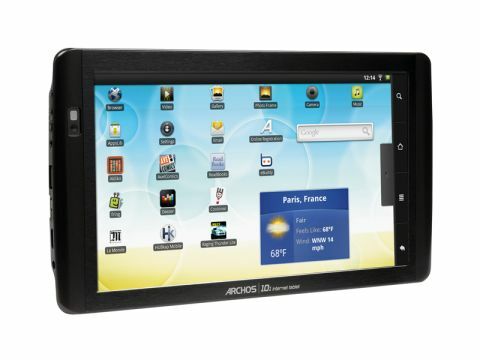 Many tablets have four physical buttons along one edge for performing home, search, menu and back functions, but the Archos 101 integrates these with the touchscreen instead. This works perfectly well. The screen is also pleasingly bright and vibrant. Movies look good, while photos are reasonably sharp thanks to the 1024 x 600-pixel resolution. However, the display's glossy surface does reflect light, which can make it difficult to view the screen when working in bright conditions. Web browsing is quick and simple, with full multi-touch gesture support, which allows you to zoom in and out of web pages by pinching your fingers. Web pages load quickly via the built-in 802.11n Wi-Fi, the fastest available standard for wireless browsing, although there's no 3G support. There's also no support for streaming video through websites such as BBC iPlayer or Channel 4's 4OD, and you'll need to download a YouTube app if you're a fan of the video hosting site. You also can't access the Android Market to download apps, but Archos has provided an online store that has a reasonable selection of free and paid-for apps and games. Performance is strong despite the limited memory, with an ARM Cortex A8 processor running the show. Slowdown was minimal, even with a number of applications open, although we did experience the occasional crash and one time we had to reset the tablet by holding down the power button. The Archos 101 is a huge improvement over the Archos 9, with a responsive and beautiful touchscreen, excellent features and fast networking. It's a shame there's no Android Market, but the Archos alternative is commendable.